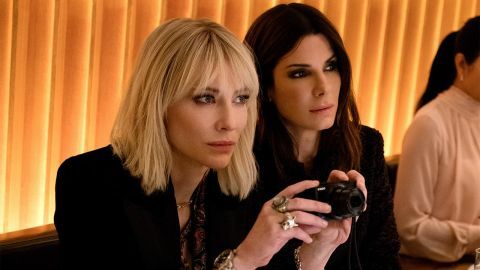 Ocean's 8 review: "Simply doesn't have the original's magic"
Full of charismatic performances but low on tension, this glitzy haute-couture heist adds female-centred fun to your favourite felon franchise. Eleven years on from Steven Soderbergh’s sparky trilogy (2001-07), this sister caper gleefully flaunts its family resemblance. A stylish, amusing but over-faithful offshoot, it swaps casino-cracking for raiding the red-carpet riches at the swanky Met Gala. Newly released jailbird Debbie Ocean (sibling of the apparently deceased Danny) has long had plans for the famous Cartier ‘Toussaint’ diamond necklace, a chest-crushing piece worth $150 million. Sandra Bullock gives sleek survivor Debbie a playful intensity, scamming herself Bergdorf clothes and a luxury hotel room before the ink’s dry on her parole papers. Her laser-focus on this all-but-impossible robbery pulls in longtime pal Lou (Cate Blanchett), a voice-of-reason crooked club owner who’s the Dusty to her Danny. Director Gary Ross (The Hunger Games) makes the set-up of their crew of skilled scammers a wisecracking scramble, first reeling in bankrupt fashion legend Rose (Helena Bonham Carter, channelling Vivienne Westwood) to persuade spoilt Gala host Daphne Kluger (a haughty Anne Hathaway) to borrow the rarely seen jewel... so that they can rob her. Like their Ocean’s predecessors, the plundering posse are witty, one-note characters: Rihanna’s chilled hacker; Mindy Kaling’s mother-pecked jeweller; Awkwafina’s wily pickpocket; and Sarah Paulson’s suburban-mum-turned-fence. But the jewel in the crown however is Anne Hathaway’s vain, status-obsessed starlet, secretly far shrewder than her mirror-gazing, airhead attitude would suggest. Subtly spoofing her own big-screen career (remember that Ocean’s Twelve Julia Roberts-impersonates-Julia Roberts gambit?) she’s having a positively illegal amount of fun. That said, the shambling, squabbling charm of Danny’s boys has gone AWOL. Ross’ movie prefers its sisterhood cool and mostly unflustered, with a plot wound as tightly as a Swiss watch. The gang speedily infiltrate everything from the seating plan to the security cameras. As such, by Gala night the story has become the kind of big-girls-night-out, gags-and-glamour thriller that pairs well with prosecco. Filling its frames with gorgeous frocks, rocks, artworks, and celebrity cameos (Anna Wintour, Heidi Klum, and the Kardashian klan rock up, among many others), it still finds room for a few feminist grace notes. That’s because Debbie’s plan relies on the fact that: “A him gets noticed, a her gets ignored.” Using a satisfying mix of good old-fashioned grifting, pickpocketing, and high-tech hackery, the crew’s pre-party ‘long con’ seems to promise something special. But the quick-cut jigsaw puzzle of the Gala heist is laid out with an oddly undemanding slickness. When the posse play frantic pass-the-parcel with Debbie’s long-sought diamonds, the sequence lacks an a-ha moment to match Ocean's Eleven’s SWAT-team switcheroo. The inevitable twist or three in the tale that follow this have a similar formulaic feel, though James Corden’s cheery insurance investigator (“Is it genetic? Are the whole family like this?”) perks things up. Truth be told, Ross’s smart copy of Soderbergh’s house style, right down to the split screens and swaggering soundtrack, simply doesn’t have the original’s magic. Rather than lingering so long over its lavish simulation of the Met Gala (much close study of Vogue doco The First Monday in May obviously took place), the film could more usefully have found itself a truly clever capper.